In the Visser house, Van Eyck added a brick cylinder to Rietveld's basic design to accommodate an art collection. 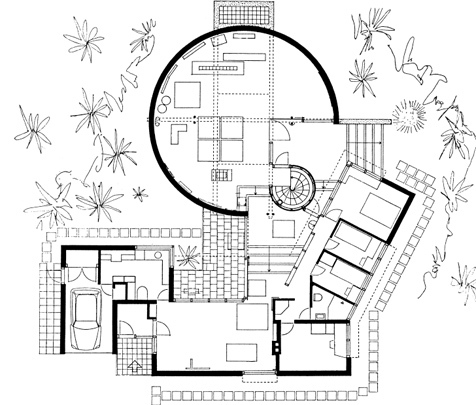 One quadrant of the cylinder is left open and connects to the original residence with a glazed intermediary space. By placing a cylindrical staircase asymmetrically where house and exhibition area meet and by allowing the outdoor area to penetrate indoors, Van Eyck succeeded in creating a dynamic space from the static circle shape.